Bestselling author Jim Benton is back, with a brand-new spin on a favorite series! 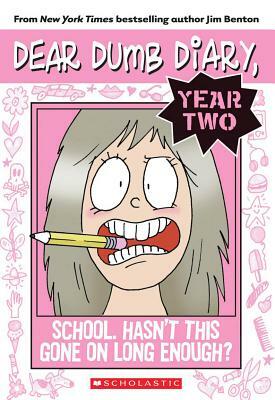 Dear Dumb Diary is a hilarious hit! Now after 12 books (each covering a month of her life), Jamie Kelly's upcoming diaries have a fresh look and a fun twist. It's Dear Dumb Diary: Year Two! The diary entries are still laugh-out-loud funny -- but this is a whole new beginning. Everything is another year dumber! As Jamie grapples with school, grades, and middle school's Big Questions, don't miss even more of her words of wisdom like, "If someone is really, really intelligent, it would be polite if they would ugly it up a bit before they left the house." Jim Benton is a New York Times bestselling author and the creator of many licensed properties, including the hugely successful It's Happy Bunny. He's created a kids' TV series, designed clothing, and written books, such as the Franny K. Stein series and the bestselling Dear Dumb Diary series. Jim lives in Bloomfield, Michigan with his spectacular wife and kids. Visit him online at www.jimbenton.com and on Twitter at @JimBenton.